Washington, D.C. (October 28, 2014) — As the transformation of the iconic L’Enfant Plaza continues, The JBG Companies is unveiling the comprehensive renovation of 955 L’Enfant Plaza. The 295,000-square-foot building, originally constructed in 1967 as part of renowned architect’s I.M. Pei’s master plan, underwent a $12 million renovation to reposition the office building for both GSA and private sector Class A tenancy. Contemporary finishes to the lobby include sleek marble floors, a stone focal wall, architectural metal accents and a commissioned painting, by renowned artist John Hartman, depicting an aerial view of Washington, DC. The renovation dramatically changes the look and feel of 955 L’Enfant Plaza. This well-connected office building sits atop the five lines servicing L’Enfant Plaza Metro station, has direct access to Interstate 395 and is within walking distance of the National Mall and the Southwest Waterfront. Additional highlights of the year-long renovation include a new 50-person conference center, a two-story floor-to-ceiling glass entrance, concierge service, upgraded elevator cabs, a grand stairwell with direct indoor access to 120,000 square feet of on-site retail that greatly enhances the tenant experience. With its transformative makeover, 955 L’Enfant Plaza also has comprehensive upgrades to the building’s mechanical systems to improve overall efficiency. The certification process under the LEED Existing Building and Operations Maintenance program is underway, which targets significant sustainable practices and energy conservation. L’Enfant Plaza has also earned the EnergyStar label. The property purchases 50 percent green-e power and offers many sustainable features including produce delivery from local farms, bike storage and electric vehicle charging stations. The 1,600-space garage was also renovated with the installation of a new lighting system featuring wireless control technology for motion-sensor activation and hourly programming for 60 percent energy savings. The following is a timeline for the previous renovations at L’Enfant Plaza. • The first retail phase underwent an extensive modernization and reopened in May 2011. 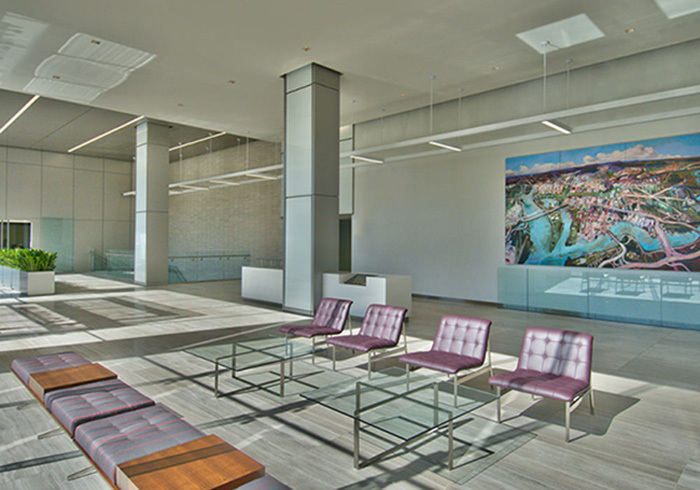 • The 470/490 L’Enfant Plaza office building underwent renovations to the main entrances, two lobbies, restrooms, and elevators, and delivered in 2012. • The second retail phase modernization included a glass atrium that provides natural light to the retail level and also serves as an entrance from the plaza level, and delivered in June 2014. More activity is on the horizon for this mixed use development. JBG is planning a new trophy office building, 500 L’Enfant Plaza, with 220,000 square feet of premiere space and views of the Southwest Waterfront. L’Enfant Plaza, an office and retail mixed-use development owned and managed by The JBG Companies, is located at 429, 470, 490 & 955 L’Enfant Plaza SW in Washington, DC. Linked to the District’s most-connected Metro rail station and positioned as one of the region’s premier mixed-use properties, L’Enfant Plaza includes 650,000 square feet of office space and 120,000 square feet of retail space. More information is available at www.lenfantplaza.com.